A few weeks ago, Kurt and I had a conversation about sports drinks. We’d both been out in the hot weather and were feeling dehydrated, and Kurt asked if a good, all-natural sports-drink type of product exists. My short answer was no. But, the more I thought about it, I decided the best option might be coconut water. I personally have not conducted any scientific tests, but I do find coconut water to be very refreshing and hydrating after working out outside in the heat of summer. And, incidentally, when I choose a brand of coconut water, Harmless Harvest is my favorite. I want to point out that this conversation and the beginning of my preference for Harmless Harvest all happened prior to that company contacting me about their Harmless Movement campaign. I was delighted to receive gifts of a branded mason jar and espresso cup and coupons for samples of coconut water. My reasons for choosing Harmless Harvest are: they use organically-grown, special green coconuts and never use ultra-processed mixes or blends; their farmers use traditional cultivation methods ensuring unique coconut flavor goes directly into the bottle; rather than pasteurizing the product, they use a special multi-step micro-filtration process to protect flavor; their product contains no GMOs, no additives, and no preservatives; and theirs is the first-ever Fair for Life-certified organic coconut water. It’s very rare that I’m approached by a brand that I am so happily willing to promote. I was able to sample a flavor option I hadn’t tried before as well. 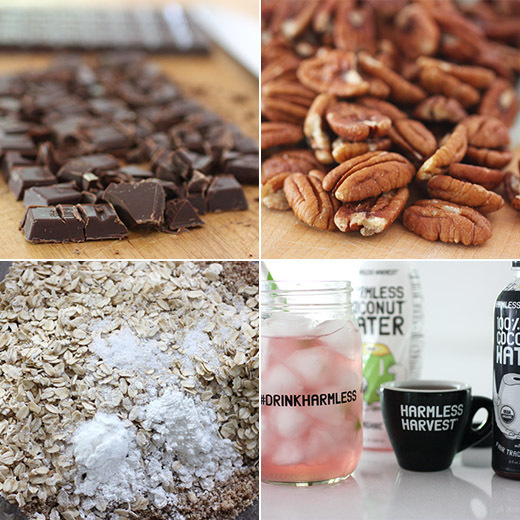 Harmless Harvest makes a coconut water with Fair Trade coffee and a little caffeine boost. I thought a snack with some dark chocolate in it would be a good match for coffee-flavored coconut water. I pulled a recipe from my files from the May 2015 issue of Living magazine, and this not-too-bad-for-you cookie with no butter, no flour, and no sugar quickly became my new favorite treat. Not often do I shout from the rooftops about a vegan cookie with no flour in it, but this really is a delicious cookie. First, pecans are finely ground, and that’s what gives the cookies body and great flavor. To the ground pecans, oats, baking powder, salt, cornstarch, olive oil, maple syrup, and vanilla extract were added. The mixture was stirred to combine, and the dough was ready to portion and bake. Keep in mind that this dough doesn’t spread or settle as it bakes, so after placing mounds on a cookie sheet, press each to the thickness you prefer before baking. The cookies baked at 325 degrees F for about 20 minutes. Kurt’s favorite cookie is oatmeal-chocolate chip, so he was excited to find these cookies in the kitchen. He took a bite and declared them fantastic before I let him know they contained no butter, no sugar, and no flour. None of that mattered. They’re rich from the pecans and olive oil, nicely sweetened with maple syrup, and the big chunks of dark chocolate don’t disappoint. 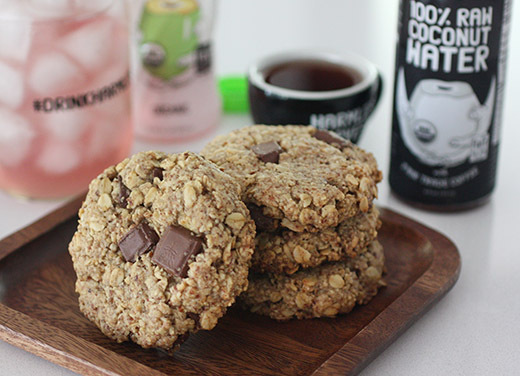 And, they go perfectly with Harmless Harvest coconut water with Fair Trade coffee. the reviews on the Martha Stewart website are not too complimentary - did these biscuits (cookies) hold together well for you - don't really want to risk the expensive ingredients .... what vegan dark choc did you use? Those comments are interesting because I had no trouble with the cookies being crumbly. I did grind the pecans very finely--to the point just before they become a nut butter. Also, letting the cookies cool on the cookie sheet may help make sure they don't break. Mine were fairly sturdy and didn't crumble. I did think the cost was considerable, though, with pecans, pure maple syrup, and chocolate. For the chocolate, I used Whole Foods Organic Dark Chocolate (on this vegan chocolate list: http://www.peta.org/living/food/definitive-guide-vegan-chocolate/). first of all, i love coconut water and have come to value it even more during this super hot summer! secondly, your cookies are awesome--their texture looks ideal and the components are delicious! I tell you, sitting at the beach and having those guys pass by offering a super cold coconut with the straws in it.... HEAVEN! We love to use nuts when we bake! We use flour, but have friends who are GF, so we use nuts a lot in those recipes. These look wonderful. And vegan? Amazing! Love coconut water, Lisa. Never have tried this brand however. Every cookie like this I've tried has not been a success..found them too dry. A breakfast cookie (http://moveablefeastscookbook.blogspot.com/2013/04/breakfast-cookies.html) I once posted is the one I turn to most often, but they are not sweet enough for masculine tastes. Interesting post...interesting comments. Hi Lisa, I will have to give this brand a try. 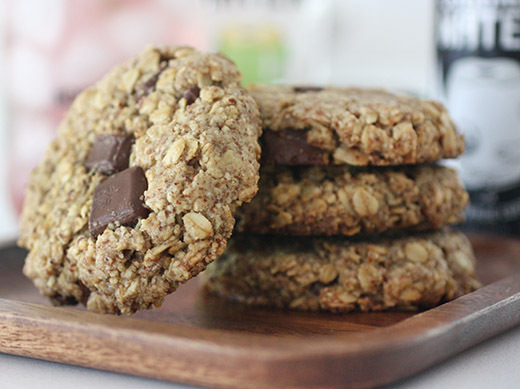 Love, love the cookies, all my favorites ingredients rolled up in one amazing little treat. Take care.